At the beginning of its 239th orbit of Mars, the Global Surveyor's Mars Orbiter Camera obtained another image of the Cydonia. At 7:02 AM PDT on 14 April, the MGS spacecraft attempted to image an area, sometimes referred to as the "City," centered at 40.86° N, 9.91° W (USGS MDIM Coordinates), see figure, below. Note that this figure shows a different position than that shown on the MGS Project web page devoted to explaining swath size. The MGS Project page does not represent what was actually targeted. The image below, a screen dump from the targeting software, is what the MOC was commanded to observe. Owing to spacecraft pointing control limitations, the actual area imaged was centered at 40.84° N, 9.98° W (see software screen dump, below). This offset, approximately 3.13 km (1.9 mi) in longitude, is greater than one-half of the field-of-view (FOV = 2.6 km or 1.6 mi), and there is very little if any overlap between the targeted features and those observed. The high resolution image has scale of 2.5 m (8.2 feet) per pixel, and was acquired at nearly a vertical viewing angle (2.35°). 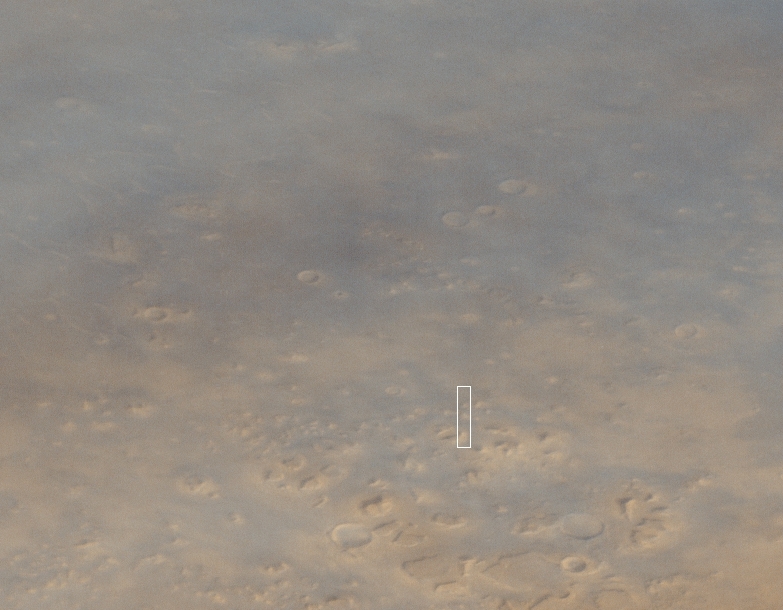 The figure above shows the low resolution, wide angle context frame acquired during orbit 239. The white box outlines the location of the high resolution narrow angle image. Note that the atmosphere is considerably clearer than for the previous Cydonia image (of the "Face"), taken last week. Some browsers apparently are unable to view them. If your browser cannot read either of these images directly, download it as a file and open the file in an image viewing or processing program. Digital versions of the raw image can be retrieved from the MGS Project web site. These images are also very big. The processed, full-resolution narrow angle image, available above, shows numerous features that illustrate why scientific interest in the Cydonia area, as well as other regions of fretted terrain (Nilosyrtis, Deuteronilus, Protonilus), is so high. Seen in this image are a number of mass movements (landslides), moated hills and peaks and intensely pitted surfaces (created by differential erosion of various layers), and features that may reflect periglacial processes (those involving the movement of ice- and/or water-saturated soil and debris).